4-H is the largest youth organization in the United States with more than 7 million participants. 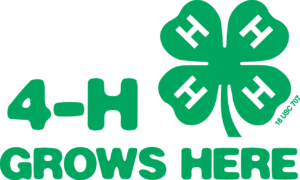 4-H is best identified by its green four-leaf clover with an H on each leaf. The four H’s on the emblem stand for Head, Heart, Hands, and Health. 4-H is the only youth organization based at land-grant universities and the first experience many youth have with higher education. The NC 4-H Youth Development Program welcomes you to get a glimpse of what 4-H is all about. Take time to participate in an upcoming event or attend any of the various program available during the year to connect with other youth and adults and learn more about what 4-H has to offer. Connect with the 4-H community as a 4-H member or as a volunteer today. To JOIN, it’s easy! Everything is now electronic with 4HOnline! Use these resources to help you get started! If you have any trouble, please contact Jessica Manning, Wilson County 4-H Youth Development, at jessica_manning@ncsu.edu or (252) 237-0113.